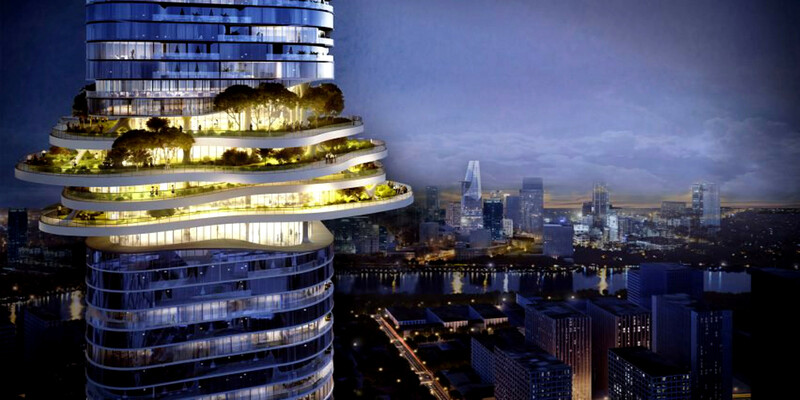 The international architecture agency Ole Scheeren has unveiled the designs of ‘Empire City,’ a new green skyscraper plan to rise on the central Saigon River peninsula in the few next years coming. 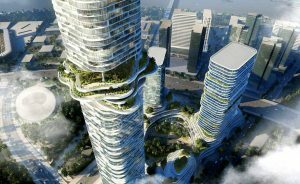 Designed to become the tallest building in Vietnam with 1,093 feet, this project will create a space interfusing a natural landscape with the growing metropolis. 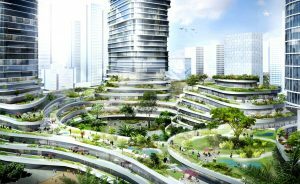 Organic lines, abundant végetation will be there to remind the tropical environment and to soften the monolithic building presence. Three skyscrapers will hover over few gardens, and the ‘ Empire 88’, the central tower will reach a height of 333 meters with 88 floors. 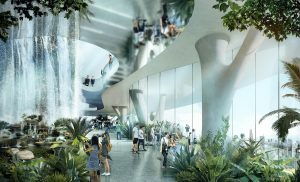 The central tower will include residences, apartments, a hotel and a public observation deck when the two other towers will welcome only offices and residents spaces. 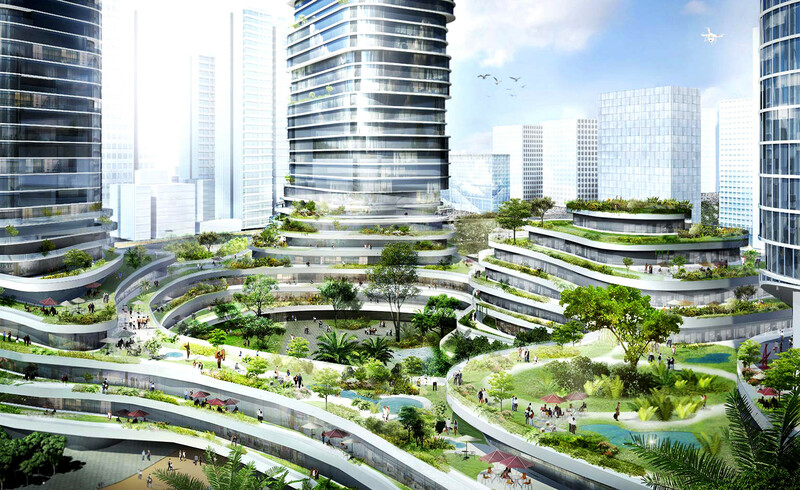 The highlight of this project is the “Sky Forest,” an elevated vertical garden rising from the building in a series of undulating rice paddies as a sign of reconciliation between the city and the countryside. These multi-level green gardens open to resident and the public will offer breathtaking views of Ho Chi Minh City and the Saigon River while at the very top of the tower, the “Cloud Space” will provide flexible possibilities for events and recreational activities, celebrating the bustling metropolis. A vast network of public activities will be developed throughout the modulated structure, linking commercial areas to recreational environments. 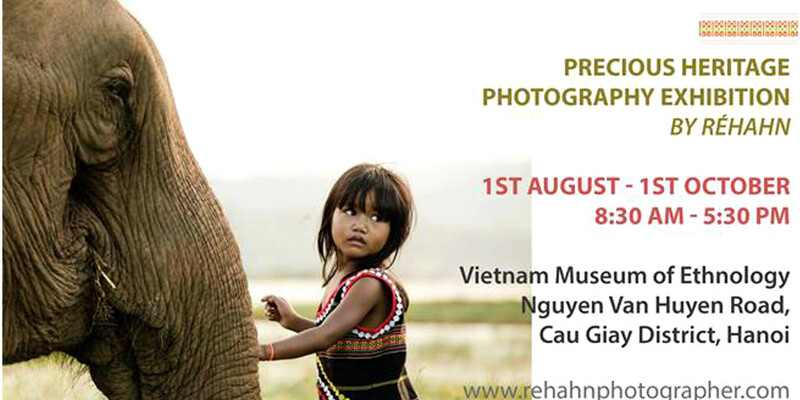 As a result, a new quality of urban life will emerge in this mixed environment that is Ho Chi Minh City, concerning life, culture, entertainment and public enjoyment. The project is being developed by Empire City Limited Liability Company, a multinational joint venture of leading real estate developers in Vietnam, Singapore and Hong Kong – Tien Phuoc Real Estate Ltd., Keppel Land Ltd., Gaw Capital Partners and Tran Thai Lands Co ., Ltd.